Super Fender consists of a 235mm diameter round Pontoon Fender. These round Pontoon Fenders offer your vessel super protection. Hence the name: Super Fender. The D Fender has a unique D shape that gives extra protection from a minimal size and has an unobtrusive appearance. Looking for a Professional Fender System for your jetty or pontoon? 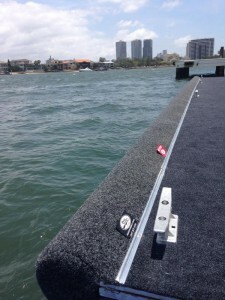 Pro Fender Pontoon Fenders and Jetty Fenders, are the major supplier to all of the Australia wide Pontoon Manufacturers and boasts high recommendations from each. 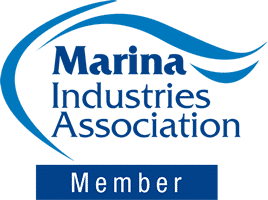 Pro Fender has products to suit all brands of pontoons including Aqua Pontoons & Constructions, Superior Jetties & Pontoons, Prestige Pontoons, Tidemaster Pontoons, The Jetty Specialists,Pacific Pontoon & Pier, Coastal Pontoons and many more. what actually happened ,I missed something ? After 20 years of putting out fenders and worrying about docking we installed a profender on our pontoon. Wish we had done it years ago, protects my boat, saves on arguements with my wife(the decky) and makes docking a simple task rather than a stressful event. Several of our friends have since installed them and without exception have been suitably impressed. Aqua Pontoons Pty Ltd and Aqua Construction Pty Ltd are loyal clients of Pro Fender, who supplies us with all our fender products for our pontoons that we sell nationally and internationally. In conjunction with the high quality products that Pro Fender supplies us, we also, could not be happier with the friendly service they provide, always striving to deliver well and beyond our expectations. Aqua Pontoons Pty Ltd fully support and recommend Pro Fender as a reputable business and service provider. The service provided by Ross & the team from Profender was outstanding, they understood the task & provided a prompt & economical quotation as well as a fast on-time installation of our new pontoon carpet & Super fender. Very happy with the results. Happy to deal with them anytime, Thanks. Hi Ross & Suzee, I felt compelled to write you a quick email to let you know how impressed we are with our new 12 x 3 metre complete perimeter Pro Fender Super Fenders. As you are aware we did our due diligence and checked out all the fenders that were on offer Australia Wide as we had over 30 metres to be installed right around our new Aqua Constructions Pontoon. From quote to completion of my job, my expectations were exceeded and we honestly could not be happier with the final result. From your expert advice to your quality workmanship, both are second to none. Once again, thank you for such a great product that looks fantastic is going to last for a long time. My Sea Ray has never been happier and I sleep better at night knowing that it’s hull is protected in any weather condition. It is an Aussie Product that truly represents outstanding value for money. Pro Fender has lead the industry in Quality, Innovation and design for over 15 years, we are committed to constant research and development to remain the industry leaders. Pro Fender have created the professional Professional Fender System which is designed and manufactured for pontoons or Jettys. You can use this fender system for your jetty or pontoon. Heat seam welding, carpet protectors covers available. Protect your jetty or pontoon with profender! Protect your boat with profender! © Copyright 2017 Pro Fender. All rights reserved.